The Zamorano Club is Southern California’s bibliophilic club -- it is to SoCal what the Grolier is to New York, and the Caxton is to Chicago. 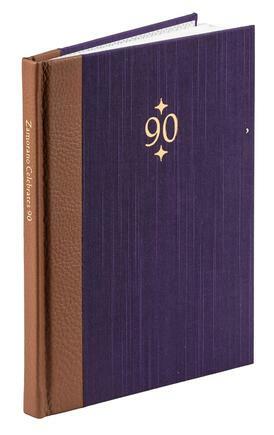 To mark its 90th anniversary last year, a volume of essays exploring the historic contributions of women booksellers, printers, and collectors in California was published, titled Zamorano Celebrates 90. Women were only offered membership in the Zamorano Club beginning in 1990; still there were many contributions to showcase, namely: Gary Kurutz of the California State Library Foundation on bookseller Alice Millard; Carrie Marsh, director of special collections at the Claremont Colleges Library, on Los Angeles bibliophile Olive Percival; Author Romy Wyllie on collector Estelle Doheny; ABAA bookseller Jennifer Johnson on printer Lillian Marks of the Plantin Press; ABAA bookseller Brad Johnson on bookseller Peggy Christian; Author Michelle Zack on librarian and collector Mayme Clayton; and author Elizabeth Pomeroy on Agnes Dawson and the women of Dawson’s Book Shop. A copy of Zamorano Celebrates 90 will be offered for sale at PBA Galleries’ auction this week in Oakland, estimated at $200-300. Quarter-bound in purple cloth and brown leather with gilt-stamped titles and decorative endpapers, this is copy 75 of 75 subscriber copies signed by all the contributors. It was donated by Johnson Rare Books & Archives, and proceeds will benefit the ABAA Benevolent Fund. Piggybacking on all that is a panel discussion organized by the ABAA Women’s Initiative during the California Antiquarian Book Fair this Sunday from 9:30-11:00 a.m. The panel brings together five contributors to discuss the Zamorano project. The panel will be moderated by ABAA member Kait Manning and features Jean Gillingwators, editor and project coordinator of Zamorano Celebrates 90; Judy Sahak, librarian emerita at Scripps College and first woman president of the Zamorano Club; Gary Kurutz; and booksellers Jen and Brad Johnson. The panel is free and open to the public. The Zamorano Club is Southern California's bibliophilic club -- it is to SoCal what the Grolier is to New York, and the Caxton is to Chicago. To mark its 90th anniversary last year, a volume of essays exploring the historic contributions of women booksellers, printers, and collectors in California was published, titled Zamorano Celebrates 90. Women were only offered membership in the Zamorano Club beginning in 1990; still there were many contributions to showcase, namely: Gary Kurutz of the California State Library Foundation on bookseller Alice Millard; Carrie Marsh, director of special collections at the Claremont Colleges Library, on Los Angeles bibliophile Olive Percival; Author Romy Wyllie on collector Estelle Doheny; ABAA bookseller Jennifer Johnson on printer Lillian Marks of the Plantin Press; ABAA bookseller Brad Johnson on bookseller Peggy Christian; Author Michelle Zack on librarian and collector Mayme Clayton; and author Elizabeth Pomeroy on Agnes Dawson and the women of Dawson's Book Shop. A copy of Zamorano Celebrates 90 will be offered for sale at PBA Galleries' auction this week in Oakland, estimated at $200-300. Quarter-bound in purple cloth and brown leather with gilt-stamped titles and decorative endpapers, this is copy 75 of 75 subscriber copies signed by all the contributors. It was donated by Johnson Rare Books & Archives, and proceeds will benefit the ABAA Benevolent Fund. Piggybacking on all that is a panel discussion organized by the ABAA Women's Initiative during the California Antiquarian Book Fair this Sunday from 9:30-11:00 a.m. The panel brings together five contributors to discuss the Zamorano project. The panel will be moderated by ABAA member Kait Manning and features Jean Gillingwators, editor and project coordinator of Zamorano Celebrates 90; Judy Sahak, librarian emerita at Scripps College and first woman president of the Zamorano Club; Gary Kurutz; and booksellers Jen and Brad Johnson. The panel is free and open to the public.